There is an online store that is called Verillas, that has such cool and beautiful clothes! 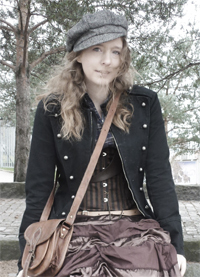 The style is a bit chic, cool and steampunk. I have not bought anything myself from them, as the clothes are a bit on the pricey side, but they state themselves that the clothes are in limited editions and are very well made. This jacket I LOVE, I so want this jacket!